Image: Image: Cract Studio. Design: Ashley Britton/SheKnows. No weights? No problem. No equipment is needed with the Freeletics Bodyweight app. The free version of the app offers a whopping 900 workouts, and the only thing you need for every single one is your body. You can’t use the “I don’t have time” excuse with this one, since you can select your workout based on time, ranging from five minutes to half an hour, and who doesn’t have just five minutes to spare? Pick from high-intensity interval training or strength-building. If you want to take it up a notch, up for a paid plan (from $1.48 per week) to get access to a coaching plan, nutrition guidance, a fitness assessment, and custom workouts. Consider this app your personal trainer. Designed specifically for women, Tone It Up’s app (from $6.99 per month) brings top trainers to your screen, offering a range of workouts from 20- to 40-minute guided sessions. There are even live classes and weekly schedules that you can personalize to meet your goals. From yoga to boxing to barre to kettlebell to strength training, there is something for everyone, and new classes are introduced every week. To keep you accountable, you can receive reminders before your selected classes start. And when you need a little extra motivation, you can connect with others in the Tone It Up community and cheer one another on. If you’re not a weekend warrior, the gym can be a pretty intimidating place. But Aaptiv ($15 a month or $100 a year) can make it feel a lot more welcoming. 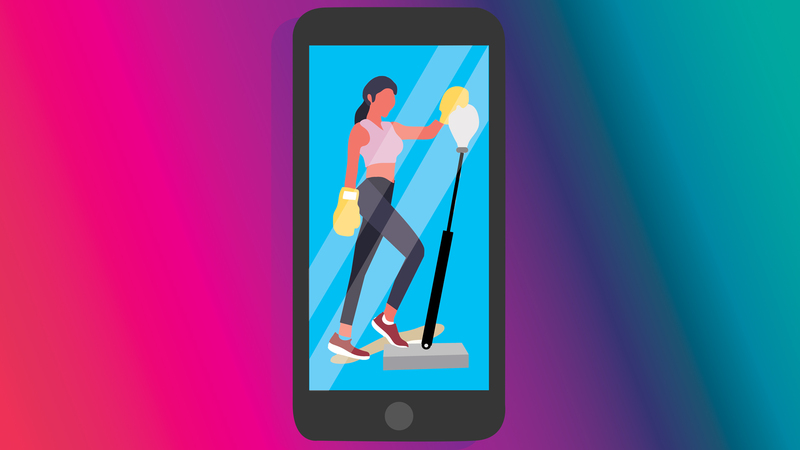 The app offers more than 2,500 workouts on demand, starting from as quick as seven minutes, and catering to a range of fitness levels. Each workout is led by a trainer, so you can get pro help for the elliptical or treadmill, or take it outside for an outdoor run, race training or cycling. There are also workouts you can do from your living room, like stretching and yoga. To keep your head in the game, each workout has a playlist of hit songs that you’ll actually want to listen to. Fitness star Kayla Itsines delivers the ultimate fitspo, so it’s no surprise that her app, Sweat, does the same. The app ($19.99 per month or $119.94 per year) includes access to the BBG, aka the Bikini Body Guide, which launched Itsines into the spotlight — and helped countless women transform their bodies. Of course, the app offers plenty of other workouts too, from cardio to resistance training to yoga to post-pregnancy to HIIT. To help you actually reach your goals, the personal training app lets you log everything, from water intake to training minutes to workout recovery time, as well as set daily targets and share progress photos. All you need is your own body — and the desire to work it — with Sworkit. That’s why over 25 million people use the app ($14.99 per month or $89.99 per year), which doesn’t require any equipment. First, choose from one of three fitness goals: getting leaner, fitter, or stronger. Then you can opt for a beginner, intermediate or advanced plan. Sweat sessions range anywhere from five minutes to an hour, making it a cinch to squeeze in exercise anywhere, any time. Have questions about your workouts or goals? You can connect with a personal trainer to get individual advice from a pro. If you’re wondering is app this is linked to Alo Yoga, the apparel line with a cult-following, your answer is yes. Alo Moves ($20 per month) offers all-access to more than 2,000 videos, which are organized into 200 plans. Even better, the biggest names in the yoga biz teach more than the 500 classes on offer, and they add new workshop series and classes daily. Alo Moves lets you focus on a single skill, like headstands, with specialized workshops, plus they also offer guided meditations and strength-boosting total-body workouts.